NOTE: ON APRIL 11, WE ARE FILING A FEDERAL COMPLAINT for "Declaratory Judgment. 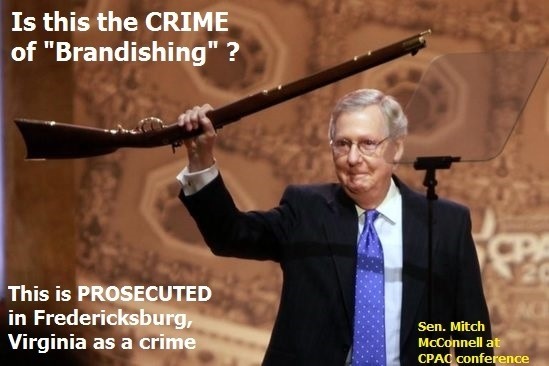 The lawsuit will seek to declare Virginia's "brandishing" statute 18.2-282 ruled unconstitutional as clashing with the Second Amendment and also for being unconstitutionally void for vagueness (violation of due process if one cannot know from the statute what is legal and what is not legal so as to act within the law without risking legal jeopardy). Virginia's generic "assault" statute 18.2-57 was also used, but that is a very broad, wide-ranging statute. As used for having an "open carry" gun in public, that is also unconstitutional "as applied" to holding a gun in public for the same reasons. Although the Defendant will not go back to court for a criminal trial until April 22, we are not waiting until then. We are going to try to defend EVERYONE's Second Amendment rights in Virginia by having these laws thrown out or modified as unconstitutional. Note: We reached and exceeded our initial, first-step goal of $1500 to get the court reporter's transcript from Frances Haley court reporting in Fredericksburg (about twice as expensive as it should have been in my opinion). And we paid the additional $860.35 transcription fee to the court reporter to have the General District Court trial transcribed on paper. This could take 10 days to 2 weeks. As of Monday morning, Jon Wolff's case is now docketed for a scheduling hearing in the Fredericksburg CIRCUIT Court on April 22, to be scheduled for a jury trial. I am afraid that the Democrat Virginia Attorney General Mark Herring, the Democrat Virginia Governor and the nationwide gun-grabbing organizations are going to come down like a ton of bricks against our lawsuit because it is a mortal threat to their agenda of disarming U.S. citizens and taking away guns. We filed the first-level appeal on April 1. So the next step will be a jury trial (Virginia is strange in how General District Court / Circuit Court works), in which we will fight for a constitutional interpretation of "brandishing" laws and "assault" laws. If the court doesn't agree to a sensible interpretation, then we go up to the real appeal courts in Virginia and up to the U.S. Supreme Court if necessary. The court reporter transcript is important to share with the big Second Amendment organizations and the news media to see if they will join this fight with us or even take it over as their own project. A disabled veteran living in Fredericksburg, Virginia needed $1310 to pay for the court reporter's transcript so that he can appeal his court case to get a new trial de novo in Circuit Court before a jury. (Virginia allows a new trial from the General District Court.) There are other out-of-pocket expenses including "pre-trial" requirements on bond, $300 at least to the bail bondsmen, legal fees, etc. However, the Fredericksburg General District Court convicted my client Jon Wolff of just HOLDING a B. B. gun "in such a manner" as to make someone feel afraid. The judge zeroed in on the word "hold" in the statute, sounded sympathetic and open-minded in discussing the case in closing argument, but felt constrained by prior precedent. Jon held his B.B. gun down by his leg holding it from the front tip, so that the gun was hanging down with the trigger down near the ground. Then he leaned the B.B. gun up against the fence, and called out to a couple making noise on private property next door "What are you doing? Do you have permission to be there?" The judge made it very clear: They are claiming that merely if someone in the area claims to be afraid -- in their purely subjective claim from their point of view -- then you just holding a gun are committing a crime in Virginia. We plan to appeal. Virginia allows a new trial before a jury in this type of case. This was planned all along knowing that the law is terrible and is being mis-used. It's called an appeal from General District Court but it is really a new trial before a jury in the Circuit Court, because the General District Court is not "a court of record." But we are also preparing to file typical appeals up to the Court of Appeals of Virginia and if necessary the Supreme Court of the United States. So we have to have the transcripts. For those who have or still want to generously donate MORE than the first-step, the excess will be applied first to any out-of-pocket costs that might be needed by Jon Wolff such as subpoenas or witness fees to get witnesses to testify for him and secondarily to his legal fees. Jonathon Moseley as a member of the Virginia State Bar is under a fiduciary duty to hold and distribute the funds under the regulation of the bar. Some of the legal fees may be payable to Jonathon Moseley, but they would otherwise fall upon the gunowner Jon Wolff. And I as the attorney would be happy to have a big Second Amendment group step in and take over the whole thing because this fight is too important to do half-way. If anyone wants a REFUND -- seeing that the initial first-step goal has been met -- you can easily request one with GoFundMe. I will delay in downloading money to the attorney escrow account at SunTrust Bank to allow for any requests for refunds. LATER if the money is not needed for the legal case, I will ask if anyone at that time wants money refunded back to them when the case is over. However, we will probably bring a CIVIL LAWSUIT, possibly a class-action lawsuit, to challenge the POLICY of the INTERPRETATION of criminal laws in Virginia -- that are vague and ambiguous and too loose -- outside of and apart from Jon Wolff's criminal defense. So the money can be put to beneficial use to challenge these laws so noe one else in the future will be charged with these loose and ambiguous laws. which will include updates and notes and also an itemized spreadsheet of how these donations are being used. Money will be disbursed out of the escrow account at SunTrust Bank only for authorized purposes to support this campaign to reform these ambiguous and vague laws to defend your Second Amendment rights. My client is a disabled veteran both from very serious injuries to his spine and mobility during military service and also a car accident in 2017. Without help he will not be able to afford to pursue these legal rights for himself and as a precedent for others.